J Clin Invest. 2011;121(9):3365–3365. https://doi.org/10.1172/JCI58960. Morrice McCrae. John Donald Publishers. Edinburgh, United Kingdom. 2010. 325 pp. $32.95. ISBN: 978-1-906-56617-3 (hardcover). This year marks the 200th anniversary of the birth of James Young Simpson, the Scottish obstetrician and medical pioneer credited with first describing the use of chloroform for general anesthesia. 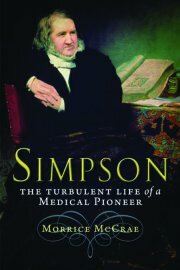 His story is researched and documented in Morrice McCrae’s Simpson: The Turbulent Life of a Medical Pioneer. A native of Scotland, consultant physician, and Fellow of the Royal College of Physicians of Edinburgh, McCrae was eminently qualified to tackle this subject. Although Simpson’s contributions to science and medicine are well known, McCrae fills the gaps of his personal story, placing the man in the context of 19th-century Scotland, at the beginning of the modern era of medicine. McCrae first describes the world into which Simpson was born: rural Scotland, his father a baker and his mother a descendent of Scottish gentry. McCrae credits his mother’s desire to recover her family’s position in society for instilling in Simpson a striving for greatness. He began university study in Edinburgh at 14 and chose medicine almost by chance. He attained his MD degree by age 21, and by 29 was elected to the Chair of Midwifery at the University of Edinburgh. The choice of obstetrics was also a trick of fate. The chair position was open at a time when other positions were not. His family spent the 2011 equivalent of $70,000 to win election by the town council: politics was alive and well in academic medicine even then! Simpson took a scholarly and innovative approach to medicine. His habit of addressing questions by first performing a thorough literature search was remarkable, as the information he was seeking was harbored in libraries throughout Europe and North America. Simpson read widely and quickly adopted techniques described in the surgical literature. Moreover, he often suggested to those outside his specialty how they might improve their practice — which contemporaries found irritating, especially when he was right. Simpson also used the emerging tools of statistics (“arithmetical methods”) to convince others of the validity of his arguments. For example, surgeons argued that ether anesthesia suppressed patients’ “vitality” and its use would worsen the already appallingly high surgical mortality. Simpson’s data, of course, showed the opposite; amputations performed with anesthesia had lower mortality than those without. When the conservative medical men refused to consider his position, Simpson quickly took the fight to the lay public. Within days of discovering the anesthetic properties of chloroform, Simpson had written and widely distributed a pamphlet entitled Account of a New Anaesthetic Agent as a Substitute for Sulphuric Ether in Surgery and Midwifery (1848). As a result, the public was clamoring for chloroform within weeks of its discovery. Although he was arguably most famous for this discovery, Simpson’s contributions include championing anesthesia/analgesia for normal childbirth; recognizing the analogy between puerperal and “surgical” fever (postoperative wound infection) and the importance of hand washing to prevent infection; and supporting women in the medical profession. Ironically, 150 years later, the leading cause of direct maternal deaths in the United Kingdom is genital tract infection/sepsis (1). A recent Joint Commission monograph addressed the challenges of hand washing because many providers still do not wash between patients (2). Women are still underrepresented in academic medicine (3), and the use of analgesia for normal childbirth remains controversial. Simpson struggled all his life with depression. On a personal level, he was devoted to his patients and family, and they to him. Most importantly, he was a reformer committed to improving the outcomes of his patients (long before “outcome” was a buzzword in medicine). The source of Simpson’s greatness, notes McCrae, was a combination of ambition and desperation. Although he never doubted his ability, he felt that others did. This often led to behavior that was arrogant, even belligerent, and, McCrae concludes, to a life more turbulent that it needed to have been. McCrae has succeeded in writing an engrossing story, enjoyable for anyone interested in the history of medicine. Illustrations of relevant people, places, and documents enliven the text, allowing us to understand the genius, humanity, and frailties of a giant of 19th-century medicine. Cantwell R, et al. Saving mothers’ lives: reviewing maternal deaths to make motherhood safer: 2006–2008. The eighth report of the Confidential Enquiries into Maternal Deaths in the United Kingdom. BJOG. 2011;118(suppl 1):1–20. The Joint Commission. Measuring Hand Hygiene Adherence: Overcoming the Challenges . Oakbrook Terrace, Illnois, USA: The Joint Commission, 2009. Wong CA, Stock MC. The status of women in academic anesthesiology: a progress report. Anesth Analg. 2008;107(1):178–184.